In a new report Fitch looks at the recent results of some of the world’s largest reinsurers and concludes that they do not reflect the market environment, but on a normalised basis they show that the large reinsurance firms are coming closer to breakeven, showing that future underwriting profitability and reinsurance pricing are likely to face increased sensitivity. On a normalised combined ratio basis the 2015 underwriting results for the four major European reinsurers show these firms very close to breakeven with an average normalised combined ratio now at 98.5%, just below breakeven, versus the average reported by the reinsurers of just 90.3%. As a result of the difference between reported and normalised combined ratios, Fitch questions their usefulness as a measure of true performance and underwriting health. Reported property & casualty reinsurance combined ratios for 2015 show strong underwriting performance and technical profitability, which Fitch notes is in contrast with the challenging market where prices continue their decline. This is because in order to widen that gap the reinsurers have either been very lucky (again) on major losses, or released more reserves in order to improve their reported combined ratios. At January 2016 reinsurance renewals Fitch notes that the pricing floor was not reached. In fact it looks like price declines are likely throughout this year, as early reports of pricing for the April renewals show another decline in regions such as Japan. However Fitch does note the slowing of the decline and also said that terms and conditions were reported to be stable, against its own expectations. On terms and conditions it is very hard to really have a clear view of the expansion or otherwise at renewals as it is largely due to reports from reinsurers themselves. With some cedants still reporting achieving better terms in January, it would seem that not all reinsurers are being completely transparent on whether terms are static or not. The gap between reported combined ratio and its normalised version is the widest seen in recent years, and the gap has been widening steadily since 2012 as well as the normalised combined ratio figure rising. So the influence of a continued low claims burden is continuing to mask the effects of reinsurance price deterioration, helping these major reinsurers to accumulate capital (returning a good deal of it to shareholders) and to report positive results. 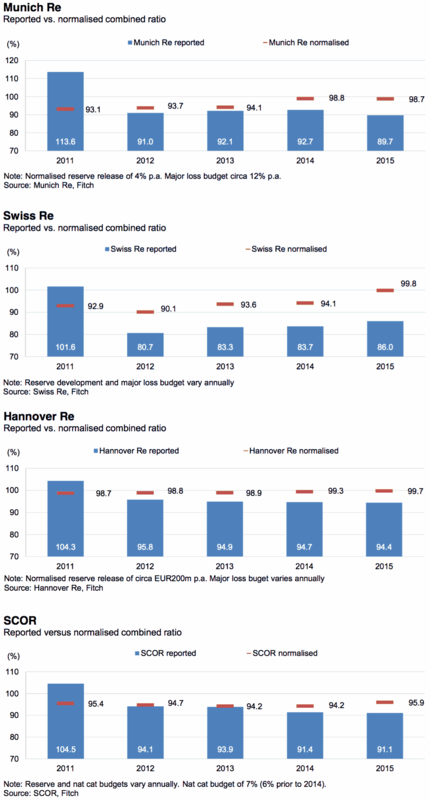 The company with the largest gap between reported and normalised combined ratio is Swiss Re, according to Fitch’s analysis, with the reinsurer having reported a combined ratio of 86% for 2015 but Fitch estimating the normalised version at 99.8%, so barely breakeven. Fitch notes how difficult it is to establish just how much of the difference is down to reserving and reserve release practices, however the rating agency explains that it does feel that these large European reinsurance firms have sufficient buffers to absorb larger claims (when they occur) and that each company continues to have adequate reserve margins. That suggests that for these companies we will not see a sudden evaporation of the effects of reserve releases on their results, even if reinsurers remain free of major losses for another year. However, with price pressure expected to persist and prices likely to continue to decline at the key mid-year reinsurance renewals in 2016, these companies aren’t going to find life any easier. As a result the prudence of reserving practices is perhaps becoming increasingly important for these firms, enabling them to report much better results than the current year underwriting profitability alone would have implied. Of course this also emphasises the need for greater efficiency and control of expense ratios, as well as the need for discipline now becoming vital. The reinsurance market may be tempted to compete ever harder on price and terms, but for reinsurers that want to be around for the next 100 years, as some of these have been, the need to focus on technical underwriting profit has perhaps never been more evident. It will be interesting to see just how much more sensitive reinsurance market pricing and conditions may be to a larger loss. It continues to be just as likely that an aggregation of smaller events could also push traditional reinsurers to push for price hikes. Of course the question then will be whether the reinsurers have their price hike ambitions met, or whether efficient capital looks to keep the pressure on by undercutting them. It also means that insurance-linked securities (ILS) players perhaps have an opportunity to continue to eat away at property catastrophe market share, as we may see some of these larger reinsurers pulling-back as some risks may no longer meet their technical return requirements.